The little group of ruins of what was once the fermtoun of Upperton in Glenbuchat by Strathdon has recently been designated a listed site by Historic Scotland. The site has a long history dating back to the 1696 Poll Book which recorded Upperton as one of 14 fermtouns or clachans in the parish of Glenbucket (as it was spelt then). Written by JOHN NISBET. He was Professor of Education at Aberdeen University from 1963 to 1988. His interests include orienteering, golf, hill-walking and even occasional rock-climbing, as well as amateur archaeology. The little group of ruins of what was once the 'fermtoun' of Upperton in Glenbuchat by Strathdon has recently been designated a 'listed site' by Historic Scotland. A distinctive feature of Glenbucket (as it used to be spelt) was the existence since feudal times of a number of 'fermtouns' throughout the glen. These little groups of cottages point to the existence of the old system when houses were huddled together both for protection and cooperative working. The 1696 Poll Book recorded 14 of these fermtouns in the glen: Upperton, Belnaglack, Belnaboth, Peatfold, Badenyon and others. These names survive today only as farms, but the nucleation of cottages has been largely obliterated -- except in Upperton where we can identify 11 sites of former cottages (all ruins except one) west of the present farmhouse. -- 15 adults in all (children below taxable age were not recorded). The Hay family continued to live there for over 200 years, and a descendant, Doug Hay in Alberta, has taken the initiative in setting up a 'glenbuchatancestors' website. Conditions of life in the Glen were fairly primitive. As Upperton lies high in the upper part of the glen (about 1100 feet), the growing season was short and a wet autumn could prove calamitous. In the famine of 1740-41 when crops failed: a group of seven people were found dead from starvation at the holy Well of Culdearg, above Upperton, where they had gone to die. Weather records of the time can give only a hint of what life was like. In 1782 ('the black aughty-twa'), for example, heavy snow fell from 1st to 14th February, and hard frosts persisted for eight weeks. There was another great fall of snow from 11th to 28th March. After the short summer, snow returned on 15th September and again on October 31st: oat crops were ruined and it was Christmas before the crop was cut -- and even then it was only fit for cattle feed. Severe weather may have prompted the emigration from the Glen which began in the 1820s. 1810-19 was the coldest decade since the 1690s. In 1812, there was drifting snow in North-East Scotland, followed by a wet summer when crops failed; the snow in January 1814 was the worst for 20 years; and 1816 came to be known as 'the year without a summer'. There was deep snow every year between 1834 and 1839 (9 feet deep in 1835, blizzards in 1837, and snow in June in 1838. At the head of the glen, at 'The Balloch', there was an outcrop of limestone, and on the moss above Upperton there was a plentiful supply of peat. Kilns were built throughout the glen in which the stone was baked into quicklime which, spread on the acid soil, substantially increased the yield. Each farm had its own kiln, built by the farmers with loose stones (and some still standing after 250 years), all different in detail though on a common pattern, open to the top with a large draw hole at the foot on one side. (We traced 105 of these in the Upper Strathdon area.) Other neighbouring glens had no limestone, and the Glenbuchat farmers made some money on the side by selling their lime. (There is a record from the early 1760s of an attempt by Earl Fife to prohibit the sale of lime, which he saw as part of his own monetary rights.) Another money-spinner of the time was the illicit distilling of whisky; and Glenbuchat whisky was reputed to be as good as Glenlivet over the hills. Glenlivet became legitimate and flourishes to this day, but the Glenbuchat trade was stopped by the excisemen. When they appeared in the district, the news was flashed through the glen and the 'worms' were hidden away, until one day (so the story goes), disguised as women, they surprised the distillers at work. Then, with the turn of the century, a new development brought radical change: this was the move towards 'enclosures' (or 'improvement' as it was called) in estates across the country, as landowners saw the opportunity for larger farms and increased rentals. In many of the Scottish estates at this time (in Upper Deeside, for example) this so-called 'improvement', combining small croft lands into larger units, often resulted in evictions. In Glenbuchat, however, it seems to have been a gradual process without serious disruption. Through the 18th and 19th centuries, nine families lived in Upperton. From old parish records we know some of the events of these families up to the first national census in 1841. After that, census data every ten years enable us to follow in more detail the fortunes of the families at Upperton. Records in the Aberdeenshire Rateable Valuation Book in the Central Library covered the final years from 1923 on. A mapping of the site by RCAHMS in 2005. made prior to its designation as a 'listed site', identified (with reasonable confidence) the sites of the buildings occupied by these families. Today all these buildings except one are in ruins. The nine families in Upperton were: Hay, Beattie, Michie, Allanach, Reid, McGregor, Walker, Anderson and Gauld. In addition, a branch of the family Ross is recorded at Upperton in the 18th century but they are not recorded after 1815. John Hay, listed in 1696, was granted the tack (lease) of Upperton in 1705 for 19 years (the customary period) at £40 Scots (£5 English) annually. This was renewed from time to time: a copy of the lease (or 'tack') to John Hay in 1765, signed by him and the Earl of Fife, is preserved in King's College Library (MS 3175/829 1748-1783). John Hay had three sons, two of whom moved to other farms in the glen, and when John died in 1715, the youngest, Adam, took over the lease. Adam and John were the favoured names in the family: these names in turn farmed Upperton, John from 1750, Adam from 1790, and subsequently John and Adam. Samuel Walker is named as one of the Upperton tenants in an 1813 advertisement (in the local paper, inviting applications for leasing). Jane Walker, presumably his daughter, was born in 1801 there. Her story is told below. Peter Beattie was resident at Upperton in the 1730s, but we do not know of his family. William Beattie was given the lease of a lot at Upperton in 1818 and farmed there until his death in 1851, when his son William took over till the end of the century. Alexander Michie (spelt Michy) was one of those resident at Upperton in 1696, but the next mention traced of the family was in the 1841 census, when Jane Michie, living alone, was described as a 'pauper'. The Allanachs are not listed in Upperton until the 1841 census. The Reid family moved to Upperton from the nearby farms of Belnaglack and Beltimb between 1815 and 1820. John McGregor born in 1776 was the Upperton blacksmith and also farmed one of the lots. He married Margaret Stuart in 1811 and their son Colin (who later took over the lease) was born in 1812. William Gauld is named as one of the tenants of Upperton in the 1813 advertisement. Some time before the 1841 census, this lease (one of the larger lots) was taken over by John Gauld. In the churchyard of the Old Kirk of Glenbuchat, the gravestone of William Ross records him as resident in Upperton (born 1713, died 1771, and names also his wife Isabella Michie (born 1722, died 1787) and children Ann, John, James, Margaret, William and Jean. In the 1813 advertisement, the tenant is Walter Ross, presumably a grandson. Forbes was near to death when he made a last effort, killed Mowat and won his bride -- hence the name of the hill above the lea. The major reorganisation of leases by the Glenbucket estate about 1810 was mentioned earlier. At Upperton, the old 'rigs' were transformed into a series of 'lots'. The Fife estate's advertisement in the local paper in 1813, inviting offers for leases in the Glen, named Walter Ross, William Gauld and Samuel Walker as tenants of Upperton, but the other families (Hay, Beattie, Michie, Allanach, Reid, McGregor and Anderson) continued to occupy their allotted parts of the fermtoun. An 1865 map recovered from the estate papers shows the division:. Lots 1 and 8 were the largest, with rectangular stone-walled enclosed fields. (Most of these dry-stone dykes still stand today or their line can be seen on the hillside or are marked by an unusually positioned gate.) A portion of the lands were retained for the remaining occupants of the clachan and divided into strips. Each farm cottage was allocated an enclosed strip of ground (with access to common hill grazings), enough to keep a cow or a few sheep, or grow some crops, but not sufficient for the tenant to make a living. As they became vacant these cottages were let to tradesmen – carpenters, shoemakers, tailors and other occupations such as gamekeepers and farm labourers, or those too old to work or widows with little means of support. Adam became an itinerant ploughman, first in Tomintoul, then Aboyne, then to Aberdeen to join the police, and finally to Old Kilpatrick in Dunbartonshire. One of this man's ten children, again Adam, emigrated to Canada, and was the father of Doug Hay who compiled a genealogy of the family. The larger lots in Upperton through to mid-century were held by William Beattie, Robert Allanach and John Gauld. Willliam Beattie was given the lease of one of the larger lots in Upperton in 1818 (recorded in 1851 as 20 acres and in 1871 as 50 acres, 20 arable). He married Isobel Gordon in 1814 and they had ten children. William Beattie had the farm from 1818 to his death in1851, when his son (one of seven children, also William) took over till his death at Upperton in 1900. The Allanach farm was 32 acres in the 1851 census. Robert Allanach farmed there till his death in 1856. His gravestone in the Old Kirk also records the death of his wife Mary in 1868. The farm then passed to his son Alexander, but in the 1871 census the farm (now only 5 acres) is run by Ann.Allanach. Ann was born in Banffshire and her oldest son was born at Inveravon in Banffishire: it is not clear what relation she was. In 1901, Ann 67 is still in Upperton (recorded as ‘farm grieve’s wife’) with her grandson Alexander 14, but none of Ann’s three children have remained at Upperton. She died in 1924 aged 84 and her gravestone is in the Old Kirk. The other substantial holding (10 acres in 1851) was farmed by John Gauld until 1871 when he was 70. In 1871, the tenant is Ann Allanach, recorded as ‘head of the family’ and ‘occupier of 5 acres’. In the 1861 Estate records another Allanach, Alexander, is the tenant of one of the smaller lots. The Gauld gravestone in Glenbuchat Old Kirk graveyard records the death of Alexander in 1910, and of John Gauld of Upperton in 1926 (but his relation to the older John is not known). The other families in the fermtoun, Michie, Reid, McGregor, Anderson and Walker, leased small strips of land running down from the rough grazing to the river. The Michies were among the less fortunate. Jean Michie, living alone in one of the Upperton cottages in 1841, is registered as a 'pauper'. One of the Beattie family, Ann, married Harry Michie from Badenyon in 1835, but in the 1841 census, she is recorded as Ann Beattie, living at Upperton with two children of the surname Michie, Mary (or Maria) and Helen. In the 1851 census, she is in Upperton as Ann Michie, widow 'independent', with two daughters. She is listed in the Poor Roll in 1849 as partially disabled, blind in one eye. No Michies appear at Upperton in the censuses of 1871 and 1901. Arthur Reid and his wife Mary Hay lived at the nearby farm of Beltimb where four of their sons were born, but the last son, Alexander, was born in Upperton in 1821. Arthur died in 1824 and is buried in the Glenbuchat graveyard, and after his death his widow and four sons emigrated to Canada, but one son, Adam, who was a shoemaker, stayed on in Upperton. until his death in 1875. He is buried in the Old Kirk. Emigration from the Glen may have been prompted by the severe winters and wet summers which marked the first 40 years of the 19th century: there were seven severe winters and only three dry summers in the four decades, and 1810-19 was the coldest since the 1690s. In 1812, there was drifting snow in North-East Scotland, followed by a wet summer when crops failed; the snow in January 1814 was the worst for 20 years; and 1816 came to be known as 'the year without a summer'. There was deep snow every year between 1834 and 1839 (9 feet deep in 1835, blizzards in 1837, and snow in June in 1838. John Walker was a shoemaker by trade, and farmed a strip of land in the township until about 1850. He had a son William, who also worked as a shoemaker who took over the croft, and a daughter Jean (or Jane) – her story is told below. William and his sister continued to live at Upperton until Jane's death in 1879. Peter Anderson shared a small croft of 2 acres with his father William. He was unmarried, and lived with his sister Henrietta as housekeeper. Peter Anderson and Jean (or Jane) Walker had an illegitimate daughter, Jane, in 1837/8. Jane was living with her mother in the 1841 census (listed as Jean age 3 and recorded as 'niece'), but by 1871 she has taken the name of Jane Anderson. In the 1861 Estate records, ‘Widow Anderson’ holds Lot 6, valued at £3; and in 1871, Jane Anderson is named as ‘head of the family’ and ‘occupier of 2 ½ acres arable’. Henrietta (Harriet), Peter's unmarried sister, lived nearby in a separate house, and is described as a ‘pauper’. The 1901 census records Jane Anderson is living alone as a ‘crofter’, but she died that year. For me, after tracing her story in the records, it was a very moving experience to discover one day the gravestone in Glenbuchat Old Kirk where she is buried alongside her mother, Jane Walker. The reorganisation of the estate was not the only important change at this time. Communication beyond the Glen was opened up by the construction of the turnpike road system in the 1820s. The Forbes family of the Newe estate adjacent to the Glen gave funds for a road from Alford to Strathdon, and a new road was built through the upper part of the Glen in the 1820s. When the branch line of the railway came to Alford in 1859, lime could be imported more cheaply from Aberdeen than quarried and burned in the Glen, and the old kilns finally fell into ruin. Although the first 40 years of the century saw harsh weather and disastrous harvests occurred from time to time – for example in 1845 and '46 (the blight which caused the Irish potato famine) -- the middle years of the century generally saw a prosperous development of agriculture in rural Scotland, which continued until 1870. Then the onset of a depression in agriculture ended the relative prosperity, and the younger folk left to find employment in the towns. The census population of the Upperton fermtoun was 38 in 1841 and again in 1851, rising to 63 in 1871, when it began a sharp decline (to 27 in 1881 and 34 in 1901). On the grouse moor in 1872 the laird and his guests (including the Duke of Buckingham) shot 10,000 brace. and the 1901 census showed evidence that it was already in a state of decline: only five of the original families were still in Upperton, and the majority of the remaining residents are elderly. James Beattie is the youngest of the tenants at age 29. Living with him are his mother Jane 64 and sister Ann 40. James died in the Aberdeen Royal Asylum in 1925. Alexander McGregor 41, the youngest of three sons, had taken over the role of carpenter, with his wife Penelope and seven children. Their four sons all fought in the 1914-18 war: Colin in the Machine Gun Corps and John in the Gordons survived; William who was in the Gordons died in England in 1915 aged 19, and Alexander, a Lance-Corporal in the Seaforths, died on 2nd October 1918, just before the armistice – he was 20. Mary McGregor 84 was also resident in Upperton but lived in a separate house: she died at Upperton in 1902. In the census, Jane Anderson 63 is living alone as a ‘crofter’ but that was the year when she died. Her story is told above. Ann Allanach 67 is still in Upperton (recorded as ‘farm grieve’s wife’) with her grandson Alexander 14, but none of Ann’s three children have remained at Upperton. She died in 1924 and her gravestone is in the Old Kirk. Of the others, the Gauld family had moved to the nearby farm of Auchavaich: William Gauld died in 1901, and his brother John in 1926. Donald Grassick appears in the 1901 census as a new tenant; he died at Deochry in 1915. There are no entries in the 1901 census for Reid or Michie. Who then were left at Upperton after 1918? The last families were Hay and McGregor: the Allanachs had already left in 1917. The last of the Hays, the family who had lived there for over 225 years, were William and Jessie who left in 1922. Alexander McGregor also left in 1922. That year marked the death of the old fermtoun. A vigorous community continued into the 60s in the lower part of the Glen, with a shop and post office (now gone) and community hall; but in the upper part only the larger farms survived and smaller buildings fell into ruin or were preserved as holiday homes. Upperton was set well back from the road; it was high on the hill and cold, and by the end of the 1939-45 War, only the main farm buildings and one red-roofed cottage remained. Mrs Grant, widow of the estate gamekeeper who died in 1936, lived there till 1946, with three of her sons in neighbouring farms, Upperton, Netherton and Smithyford. In the 50s the cottage came into our family, and we have kept it as it was, with no electricity or running water. To live there is to step back in time. It is now a listed building, and the fermtoun is a listed site. This rare, largely unaltered vernacular dwelling at the former clachan know formerly as `Uppertoune´ or `Uppertown´ is the last of those described in the Banffshire Journal of October 1868 (reproduced in The Book of Glenbuchat) ´This is altogether a treat in the way of old cottages. We have little hesitation in saying that some of the dwelling houses (rare ones) in this clachan are over 300 years of age. The walls are all built with boulders of stone and clay. Few have any appearance of the hammer having been in use at the building. The corners are all round outside and inside the houses. Many fine convenient wall-presses and even concealments in the walls appear in the curious buildings´. Upperton Cottage is not one of the early examples described but nevertheless it is an important reminder of Glen life as reported in the Aberdeen Free Press of 8th April, 1902 ´There is a feature about Glenbucket (sic) which should not be omitted in any notice of it, and that is the existence since feudal times of a number of `clachans´ throughout the glen. These little hamlets or groups of cottages, generally numbering from seven to ten, and all occupied, point to the existence of the old system when the houses of the inhabitants were huddled together for protection, and it is of great interest to note that they still remain in Glenbucket ´ the only instance of the kind in a very marked manner known to the writer. 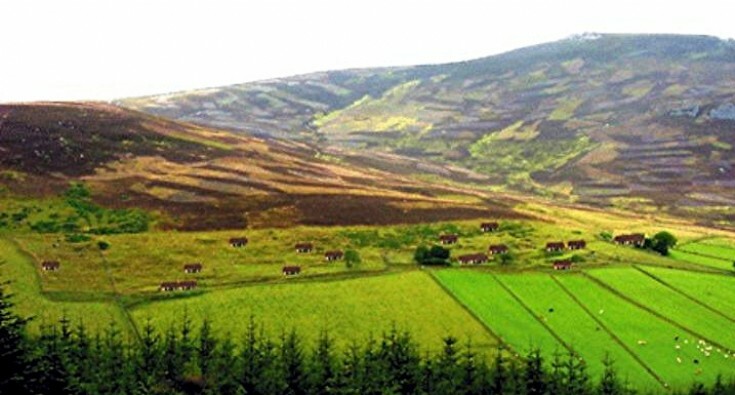 There are four or five of these `clachans´ in Glenbucket. In later times as cultivation extended, the new homestead was erected on the newly reclaimed ground. James W Barclay, who purchased the Glen in 1901, wrote at that time of `as many as ten to twenty `fire-houses´ in a clachan, built of stone, lime and clay and with thatched roofs. Peat burned in open fires with large hearths and chimneys sometimes 10 feet wide´. The 1867 Ordnance Survey map shows the clachan of `Uppertown´ with a number of small buildings irregularly spread along a natural terrace with a few remaining run-rigs spreading out below them. Since 1813, when the Fife Estates advertised their properties in Glenbuchat for let by public auction, the system of run-rig cultivation was eroded by reducing the number of tenants to form single-tenanted farms and crofts. This action would erode settlements recorded as early as 1696, when the Poll Book lists seven families living at `Uppertoune´. This fermtoun extends for a distance of some 500m from E to W at the head of pasture fields below Upperton [NJ31NE 124] and its remains represent three broad phases of activity. Firstly there are buildings abandoned prior to the 1st edition OS 6-inch map (Aberdeenshire 1869, sheet L); secondly there are buildings depicted as roofed on the same map; finally there are buildings constructed after 1869 but before the publication of the 2nd edition of the map in 1903 (Aberdeenshire, sheet L). The five buildings abandoned before 1869 lie at the W end of the fermtoun; they are all reduced to their stone footings and range from 10m to 24m in overall length. Eighteen other buildings are depicted on the first edition map, but of them only two still retain their roof. A third stands as a ruinous shell, and the remainder are either reduced to their footings or have disappeared under later structures. The two roofed buildings, which were extensively altered or rebuilt between 1869 and 1903, are still occupied, one as a holiday cottage (NJ 3641 1787), the other as the present farmhouse of Uppertown (NJ 3658 1795). A range some 35m long, with a horse-engine towards its NE end, formerly stood immediately to the NE of the farmhouse, but this has been replaced by a large modern shed. The remains of a second horse-engine can be seen at the W extremity of the site, adjoining the W end of a T-plan building that is shown roofed on the 2nd edition map. This building probably incorporates the rectangular range shown here on the 1st edition of the map, which also depicts a circular roofed structure about 10m from its W end. The nature of the circular structure and its relationship to the surviving horse-engine platform are unclear; detached from the building it was perhaps a whin mill. A crofting township, comprising fourteen roofed buildings, one of which is circular, three unroofed buildings and eight enclosures is depicted on the 1st edition of the OS 6-inch map (Aberdeenshire 1869, sheet l). Two roofed, six unroofed buildings and seven enclosure are shown on the current edition of the OS 1:10000 map (1975). This record was also previously described under NJ31NE 101 as a crofting township. Information from RCAHMS (PM) 20 August 2002. Information from Historic Scotland, scheduling document dated 1 October 2007. In the text above: "The Allanach farm was 32 acres in the 1851 census. Robert Allanach farmed there till his death in 1856. His gravestone in the Old Kirk also records the death of his wife Mary in 1868. The farm then passed to his son Alexander, but in the 1871 census the farm (now only 5 acres) is run by Ann.Allanach. Ann was born in Banffshire and her oldest son was born at Inveravon in Banffshire: it is not clear what relation she was. In 1901, Ann 67 is still in Upperton (recorded as ‘farm greave’s wife’) with her grandson Alexander 14, but none of Ann’s three children have remained at Upperton. She died in 1924 aged 84 and her gravestone is in the Old Kirk. The Ann Allanach mentioned here is Ann McKenzie who married Alexander Allanach (son of Robert Allanach and Mary Hay, who are my 4 X Great Grandparents) in Auchavaich, Glenbuchat on May 29 1863. A witness at this marriage was Alexander Gauld but I am unsure if he is related to the John Gauld mentioned. This Alexander will be the Alexander mentioned in the 1861 estate records above. Interestingly, despite being married in 1863 and going on to have 5 children together, Alexander and Ann are never together in any census records. Ann had a son Alexander in 1858, he is registered as McKenzie at birth but by the 1871 census he has taken the surname Allanach. Alexander and Ann went on to have 4 children together that I know of: William c.1865 Glenbucket, Mary c.1867 Glenbucket, Helen Ann c.1874 Glenbucket never married and died Mar 20 1947 at Royal Infirmary, Aberdeen, Aberdeen and Margaret “Maggie” c.1876 Glenbucket, Aberdeen also never married and died Nov 23 1921 in Parkhouse, Strathdon, Aberdeen. Very interesting reading, my Grt Grandmother was Mary Hay born at Upperton in 1848 daughter of Adam Hay & Jessie Farquharson, she married Robert McConnachie and raised their family at Newton of Pitcandlich near Glenkindie.